Hazel Savage CEO and co-founder of artificial intelligence start-up Musiio told us how AI can be used to filter through the noise in today’s convoluted streaming world, the progression of collaboration between music and tech, and what the European music business can learn from Singapore. Watch the full video Q & A With Hazel Savage in our E · MAGAZINE. On a regular base we will present to you exciting insights into the Reeperbahn Festival Universe in our E · MAGAZINE – from artist portraits to interviews with interesting representatives of the music industry to in-depth essays. 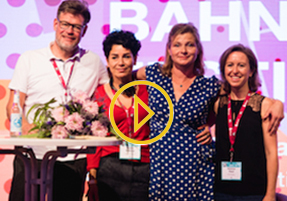 During Reeperbahn Festival 2018 we took the chance to meet a selection of outstanding speakers for interesting and inspiring video interviews. Stay tuned for various videos and insights to come! This year we established the Keychange Day as a debate enhancer on gender equality in the music industry. Representatives from all sectors of the industry were present and impressed by the variety, but also the depth of the topics discussed. One of the highlights for many certainly was the panel with Tony Visconti, Linda Perry, Pat Carr and Kinnie Starr in which they spoke about possible social changes and perspectives for women in the music industry. The day ended with the presentation of the Keychange Inspiration Award. We congratulate this year's winner Bernadette La Hengst, who spontaneously shared the award with her friend and colleague Andrea Rothaug. A compilation of all highlights as a movie can be found here. The independent festival award Der Helga!® was awarded for the sixth time and it was once again a pleasure to host the award show at Reeperbahn Festival. Festivals were being awarded for categories such as 'The Best Festival For Old People' or 'Most Graceful Camping Area'. The 'royal discipline' voted by the audience itself via online voting was 'The Best Festival Of The Year'. However many categories didn't make it into the voting of Der Helga!® but still are simply too good not to show. Lean back and enjoy the video compiled in honor of the categories left behind here. We also have compiled all the highlights of Reeperbahn Festival 2018 in words, pictures and videos which can be reviewed once again in the media library.